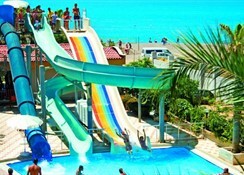 The Adinbey Famous Resort is a lively holiday complex with its own private beach situated in Antalya. 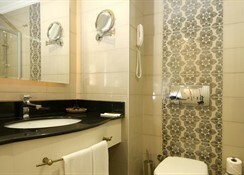 The hotel aims to live you unforgettable holiday with its good services and facilities. The modern comfort hotel is situated at the beach ordered more than 5 buildings and offers to it's guests a receipt hall with reception seat opportunities and lift.This hotel, constructed in 2005 & on the beach features a total of 238 rooms spread over 5 floors. Facilities available at this air-conditioned property include a 24-hour reception, currency exchange, café, hairdresser, bar, disco & a theatre auditorium. 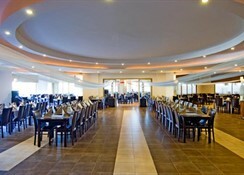 Guests can also take advantage of the TV lounge & there is a restaurant available. 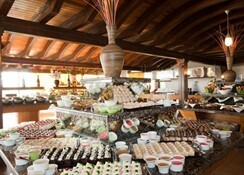 Aydinbey Famous Resort is located in Belek. It is 20 km to Belek, 12 km to Serik, 40 km to the Antalya Airport and 45 km to Antalya. Facilities on offer to guests at this air-conditioned establishment include 24-hour reception, currency exchange facility, lift, café, hairdresser, bar, disco and theatre auditorium. Guests may also take advantage of the TV lounge, restaurant, laundry services (with additional fee)and the younger guests can enjoy the kids' club and the playground. The hotel features an indoor swimming pool, an outdoor pool as well as a children's pool and a poolside snack bar with sun loungers. Guests can enjoy a session of aqua aerobics, or a spell in the Jacuzzi or sauna or relax with a massage treatment (charges apply). It is also possible to play tennis, table tennis, beach volleyball, billiards (charges apply) or basketball as sport activity or possible to work out in the gym. There is a special daily and nightly entertainment programme on offer for children and guests.